You hear this famous saying often, “It is not what you know, but who know.” Yet, when individuals think about wealth, thoughts such as money, investments, and property come to mind. Rarely do people consider their network as a source of developing wealth. However, typically our relationships with people are how we become exposed to opportunities to join communities, companies, and boards that provide us with financial gain. Referrals/ Recommendations: Recommendations are almost always required to join a company or educational institution. Having a community that knows who you are and is able to speak to your work can be a great gateway to opportunities that you may not have otherwise been considered for. According to a PayScale Study, 85% of jobs in companies are filled through an internal referral and 70% of those positions are never posted online! 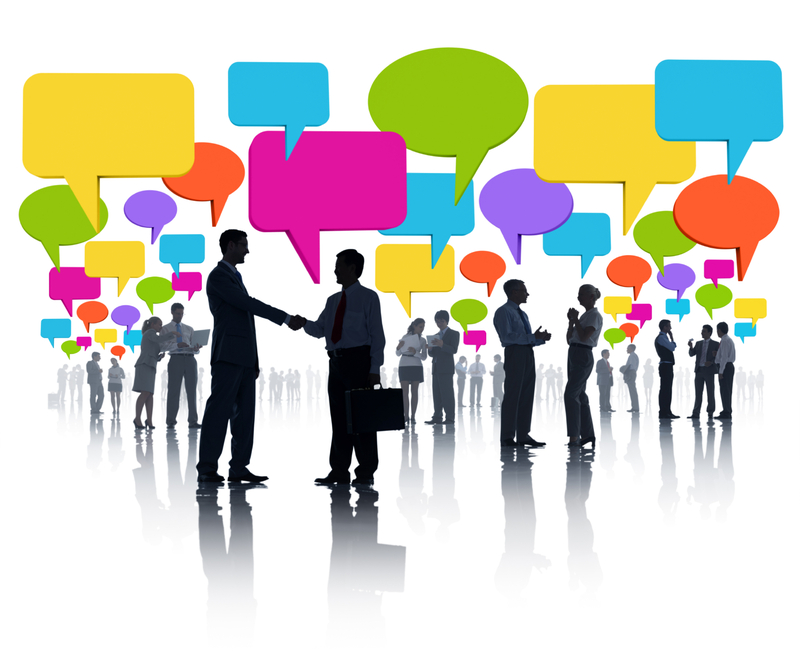 Therefore, expanding your network increases your chances of being selected and hired for employment opportunities. Gain Expertise without Official Training: while there are many pipelines for individuals to develop their expertise in an industry such as apprenticeships and internships, people who have an inter-disciplinary network have the advantage of gaining direct insight from colleagues without going through formal processes. The knowledge and insight gained from your network, can potentially equip you with the tools you need to start a new project, get promoted, or launch your own business. Hence, expanding your network can provide you with professional development without the hassle of formal training. Receive Sponsorship, Donations, Investments: If you are in a relationship based business like my role as a Business Development Associate, then you know sponsorship, donations, and investments are one of the biggest assets that keeps businesses profitable and afloat. Having a network of individuals that is interested in your work and supporting your business can potentially elicit additions funds or sponsorship to sustain or expand your company. It also can be one less resource you have to pay or search for. For this reason, expanding your networks can allow you access to more financial opportunities. 255 more veterans are making an average of $48,000 a year in careers they love! Also, 92% of those veterans have retained the employment they gained through our Network, how about that! And over half of our hires (67% to be exact) have been in Science, Technology, Engineering, or Math fields, amazing! We could not have exceeded our goals without the support of our amazing funders, employers and community. 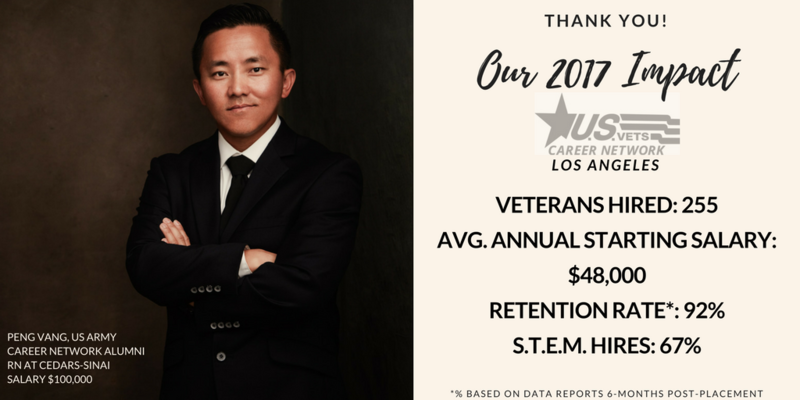 Thank you from our veteran clients, and thank you from U.S.VETS Career Network!! Happy New Year! Are you ready for 2018? Do you have a neat to-do list of how to make yourself a better, more productive individual? What are your 2018 resolutions? Personally, I think New Years resolutions are terrible. Here is why. Resolutions focus on the end result rather than the journey, which can set you up for failure. And, resolutions incentivize procrastination. For example, the goal of going from never exercising to becoming a fitness guru with a “no days off” mentality is a lofty one and will take a great deal of time and discipline. Between your current state and the goal, there are several smaller goals that must be achieved. Rather than focusing on working out 7 days a week, simply join a local gym and explore different classes. Focusing on what works for you (i.e. : The Journey) creates a sustainable plan of action and relieves the pressure to succeed immediately. So, whether your New Years Resolution is to become a fitness guru, purge your storage unit, drink more water, or land your dream job, remember these two things: 1) Every day is your opportunity to try it again and 2) Failing isn’t failing, it is just learning and re-doing. Now, with these two rules in mind, I recommend giving yourself a few simple resolutions to jump start your new job search in 2018. These 5 “resolutions” don’t necessarily have to be followed, but I hope they spark a new train of thought on how you are going to create your 2018. Traditionally, you start with a job in mind. You search for the job using any number of job boards (there are about 1,000 different ones) and then apply to it using a slightly tailored resume and a generic cover letter. Most likely, you have done some version of this dozens of times, maybe even hundreds of times. Applying to positions has turned into a numbers game where we apply after merely skimming descriptions, upload one of ten different resumes, and never think of it again. We have put our job search on autopilot. I challenge you, in 2018, to reverse this method. Instead of casting your net wide into the online sea of opportunities and hoping something will bite, work within the network you know. Your friends, professional colleagues, classmates, and fellow alumni all have the potential to be an internal referral for you. Find your goal, and see what your Network can provide that could lead you to it. For example, you could be offered a positon within a company that you have connections with, and once you gain experience there you can internally network to achieve your dream job in a different department. These opportunities will probably come few and far between, but each one will be a much more valuable opportunity than the 20 notifications you receive in a day from a job board. Build your network and use what you have to achieve what you want. Always ask for an internal referral after you apply, and do the same for others, too! Before you apply for CEO of anything, remember that you must always have the education and experience required of the positions you are applying. However, I believe like the autopilot application process, you may be stuck in rut of applying for the same positions over and over again, without re-assessing your worth. There are so many different opportunities available to job seekers today, and your knowledge, skills and abilities can translate into a plethora of different positions. Don’t let yourself get pigeonholed into the last position you held. Instead, look at the position you desire to hold in, say, 10 years. Look at people who have that position, and see where they came from, their roots. From there, you can begin to see the moves you must make in your career, and find similar opportunities to pursue. Also, keep in mind the workforce climate – many many people are vying for the same opportunities. Often, the person in the entry level or management position is actually overqualified for it. Why is that? Simply put, the best way to guarantee success is to aim for the low-hanging fruit. I challenge you, in 2018, to aim high. Seek out positions you believe to be a little out of your reach. Notice that I say “seem”, this is because if you are determined and if you have the ambition and drive to pursue a challenging job, it will yield great success for you. If you are not moving up, where are you moving? Asking for advice is a very underrated technique in finding your dream career. 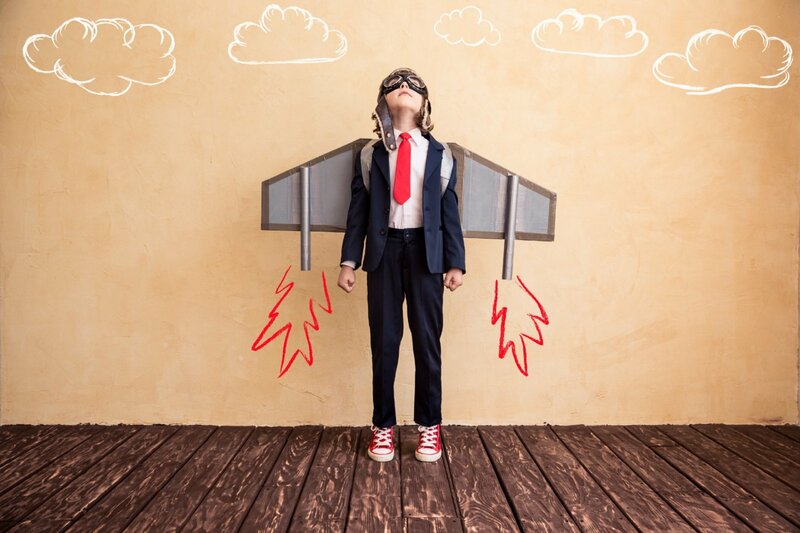 It seems superfluous to your career trajectory initially, but think about it: Who knows the best path to success better than the person in your dream job now! Mentorships begin either organically through a leader at your current place of work, or through your initiative to seek out one for an information interview. LinkedIn is invaluable in identifying and contacting a potential mentor. For those who have never requested an informational interview from someone; it is as simple an an Inmail asking for 15 minutes on the phone, or offering a free coffee after work one day. Informational interviews are the first step in building rapport, but also in gaining first-hand knowledge on the “golden path”. Every person has a unique “how I arrived” story. Sometimes it is happen-stance, and of course each story will have some form of internal advocacy, as we know that landing a job is a lot of who you know. But in each story there are also common themes, and with enough conversations you can begin to map out what would be the best plan of action for your career path. I challenge you, in 2018, to ask for help. Find your champion, and you will find invaluable knowledge, professional advice, guidance on difficult decisions, and probably a lifelong friend. Now that you have tapped into your Network, pursued ambitious roles, gained information and possibly found a mentor to guide you, it is time to check out your weaknesses. Reflection is a vital skill. It helps you understand where your strengths lie, but more importantly where you fall short. If you are repeatedly pursuing opportunities and being rejected, it may be wise to look inward. Are you missing a pertinent level of experience that other applicants have? Is there a specific area of interest or a skill you lack that this employer may not require but prefers? This year, make a conscience effort to pursue those areas that you may be weakest. Not only to better yourself as a professional, but to better yourself as an individual as well. Using your network and information you gain in your job search, make yourself the most marketable applicant. By constantly reflecting and improving, you are constantly evolving into a better version of yourself. I challenge you, in 2018, to build a skill, join a professional society, pursue leadership roles, or volunteer. All of these are actions that successful individuals are constantly pursuing. Although it may require some extra time and effort, employers will notice, and you will shoot to the top of a list of similar candidates for the initiative you take. Lastly, when the moment comes for you to take the leap of faith – take a risk! You may be offered that position you never thought you were qualified for, or you get an opportunity to move to a much larger company and become a small fish in a raging sea. All of these changes are scary, and that is good! It was Karen Salmansohn who said “The best things in life are often waiting for you at the exit ramp of your comfort zone” and I couldn’t agree more. I challenge you, in 2018, to move out of your comfort zone. I think about this quote often. In life, we often think about things and verbalize things far more frequently than we actually do things. 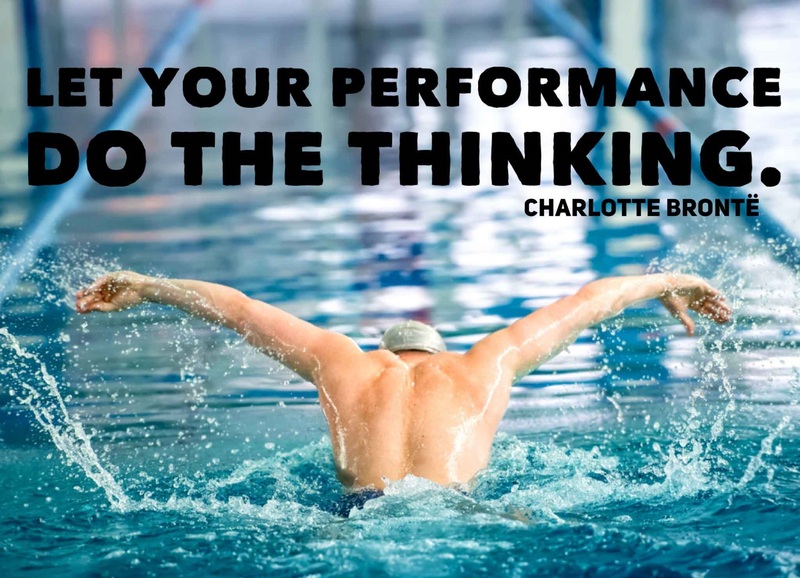 We overthink, we over analyze, and the result or the product of our hard work get lost in the shuffle. If you do not answer with a resounding “YES!” to each one of the above, then the sentence is not serving you in the way that it should on your resume. Passive words on your resume such as “responsible for” or “role consisted of” will kill your chances of being considered, no hiring manager wants to read a position description, they want to hear your achievements! Sometimes it can de difficult to brag about ourselves (I am no exception to this, I struggled with this when I was job hunting as well). So, to help you get started, I have outlined an example of the same statement, but put in both a passive tone and an action-oriented tone. You can see the difference these three questions I stated above can make. Phenomenal difference, right? Now let’s breakdown the statement with the three questions I provided above. YES – 500 clients indicates a high volume of need for one person, and shows that there was a high demand for the product or services I was offering. YES – Utilizing technology, I created a tool for my clients to access my services remotely. This shows that I am tech-savvy and innovative. It also shows that I am efficient, saving time and resources through remote coaching. YES – I positively impacted 500 clients, and through my coaching and resume writing skills I was able to assist 200 of those 500 in being hired, as well as increased the percentage of call backs for second interviews. Now that you have the algorithm for your resume bullet points, it is time to put your ideas into action! The most important factor of any resume is the action word that begins each sentence. Sometimes it can be difficult to move out of your comfort zone of composition, and that is O.K. You always want the resume to sound like you, it is a not beneficial for you to write your resume like a chapter out of Charles Dickens with long winded prose and winding sentences. Instead, find a few quick, punchy words to add to your resume content. To help you with this process, I have found a great article that outlines different action words that can be substituted in for passive content. I provided an example of some of those words, below. There are 139 of these awesome words, and they even break them down by different positions you may be applying to! Now, using your newfound knowledge on action words and resume writing, go out there and get hired! LinkedIn Headlines: Hot or Not? This type of headline showcases what you do, divided into three district categories. It is succinct and to the point, and can help employers understand the numerous responsibilities you may have under one job title. This type of headline is a fun way to tell the viewer what you do and show your impact. It is more informal and focuses on one overreaching role you may have, and the result you focus on in your work. This headline dives into your interests well as your professional identity. It is very informal, but it showcases your personality, which can be beneficial in many industries. If you are seeking a position that is high in soft-skills (retail, customer service, recruiting, outreach, sales) this is a headline that shows employers that you work hard and play hard. This headline is a combination of the first and second examples. It is clear and concise, and begins with two position duties, while speaking to the focus of your role. It is the best for branding purposes, as it showcases both your brand (who you are), and your product (the services you offer). This headline shows that you are a job seeker! It is not my favorite version, but it gets the message out there that you are looking actively. Many recruiters source candidates directly through LinkedIn (yes, right?!) and when they search for people they could filter to try and find candidates with this headline specifically. It may be ideal for current students, or transitioning job seekers. No matter what headline you choose, make it unique to you! For more information on different headlines, you can read about different versions in this article or this article. 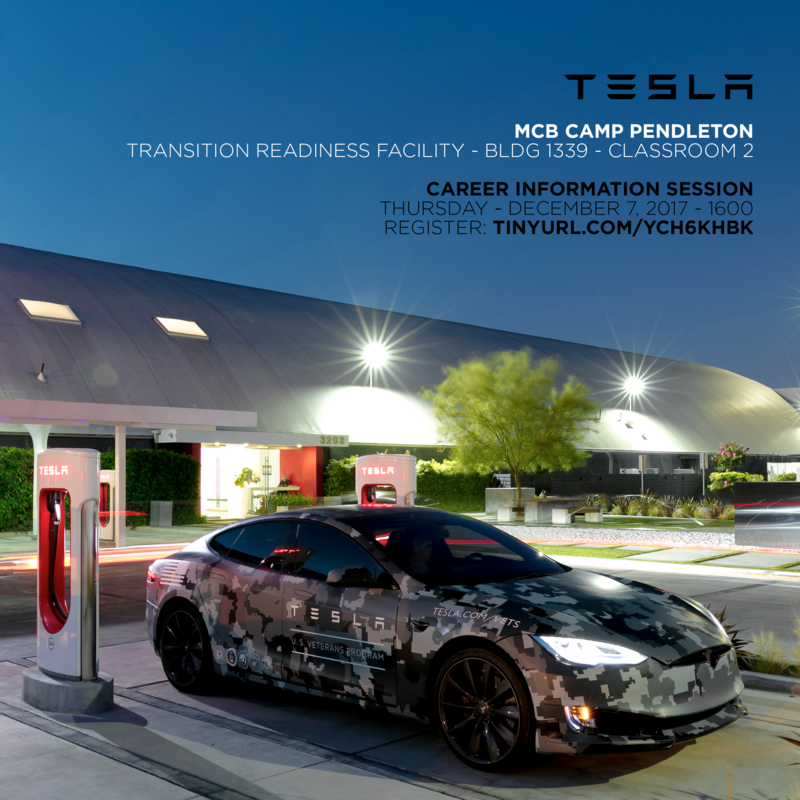 TESLA is hosting a Career Information Session! Register HERE. TESLA has a military-hiring initiative. U.S.VETS Career Network has identified Tesla as a leading employer partner for military members and their families. Founded in 2003 and headquartered in Palo Alto, California, Tesla focuses on electric cars and drivetrains. First production models of their cars hit the streets in 2008, and since then they have sold close to 2,000 cars in 31 countries. 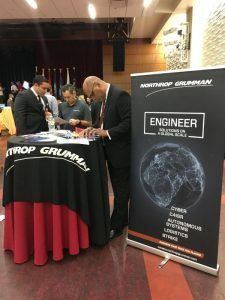 The company currently employs 45 veterans and has a few more in the hiring pipeline. Many of them are or will be working at the Tesla Factory in Fremont, California, but positions are being hired for all areas of the company. 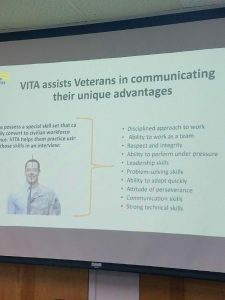 “Veterans are taught to be leaders within the context of a cooperative team, and that is exactly how Tesla works – allowing employees to think outside the box while working hard toward a common goal,” says Ricketts. Tesla’s new veteran hiring initiative includes upcoming recruiting events for veterans, including one on September 29, and ads in veteran-targeted outlets such as Swords to Plowshares and the EDD. “Hiring veterans is very complementary to Tesla’s other mission to move the world toward energy security and independence,” says Ricketts. For more information on Tesla and jobs currently available, visit the Tesla website. Read this Military.com article for more information on the Tesla Military Initiative. Learn about all of the amazing careers available to veterans, active duty service, members, and their families at this event. Thursday December 7 4:00pm – 7:00pm at MCB Camp Pendleton Leatherneck Lanes Transition Readiness Facility Bldg. 1339. Transitioning Service members, Veterans, and spouses are highly encouraged to attend. Register HERE. Are you using all of the tools you can to be a smarter job seeker? Job seekers: Are you using all of the online tools available to you, to aid you in your search for the perfect career opportunity? Chances are you are not, but there are so many resources out there in today’s internet-driven society, it is hard for job seekers to know which are useful and which are sub par. Now here is the good news is, I did all of the research for you, and found the best ones! 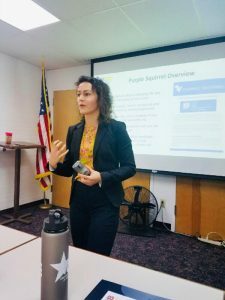 It was a pleasure teaching this workshop last week at the Pasadena Workforce Training and Development Center. Training participants on how to better their chances of finding opportunities they want, and actually getting interviews. And training career coaches on technological tools to make them work smarter, not harder. We will be hosting another workshop like this one in Los Angeles soon, so keep your eye on our calendar of events! Thanks JULIE MCELRATH and Jordan Ton for hosting me! 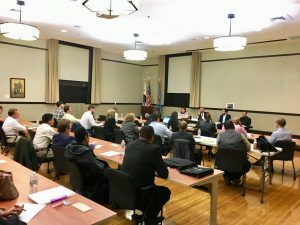 Last Tuesday we hosted an Employer Panel at our Patriotic Hall Location. 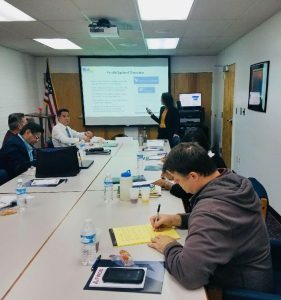 30 Veterans attended, and four companies participated, all Entertainment companies who were interested in hiring veterans and answering questions about how to get into the corporate Entertainment business. Participating were The Walt Disney Company, Live Nation / House Of Blues, NBC Universal, and Paradigm Talent Agency. Setting realistic expectations, your first job isn’t your forever job! Be prepared to work long hours for little pay, but act like you’re getting paid $100k and it shows. What makes you qualified to work in the industry? It’s a white collar apprenticeship! Mailroom to CEO, if you’re good at what you do it doesn’t matter. How to build a network, give before you take! Your relationships will take time, but the dividends will grow over time too. Don’t be afraid to talk to people in the industry, take them to lunch or coffee, and ask for information before a leg up. Mobility in the industry, learn as much as you can! Do your homework and be flexible, when the time comes you can jump on the opportunity. Entry level opportunities, you’ll be a secretary or an assistant, but you’ll get the best experience and know the business once it’s time to apply for that promotion. 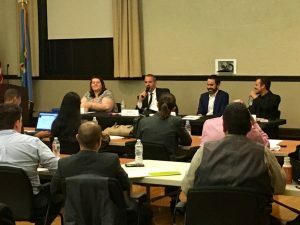 Thank you to to our panelists for taking the time to brave LA traffic, take their evening and give our veterans these great insights: Katie Jo Sheek , Walt Disney Ben Scott, Paradigm Talent Agency Kyle Skelly, NBC Universal Christopher Dyer, SHRM-CP, LiveNation/HOB. Also, special thank you to our amazing community partners who put on the event with us! 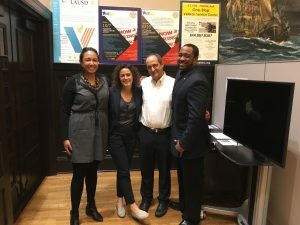 Jamie Rimphanli , Charles Smith, and Herbert Thau Alicia Long-Baker When organizations collaborate we get more done! 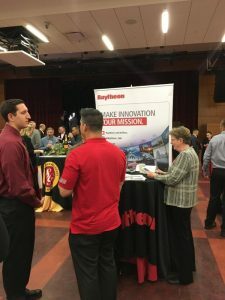 USC Veteran and Military Families Recruiting Night, a huge sucess! Wow!! 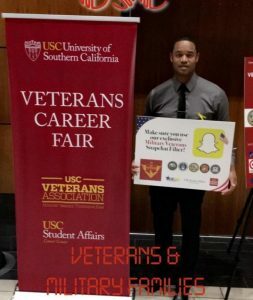 Last week was MAGICAL at the USC Veterans Career Fair, co-sponsored by U.S.VETS Career Network and the University of Southern California (USC). The room was buzzing with energy. 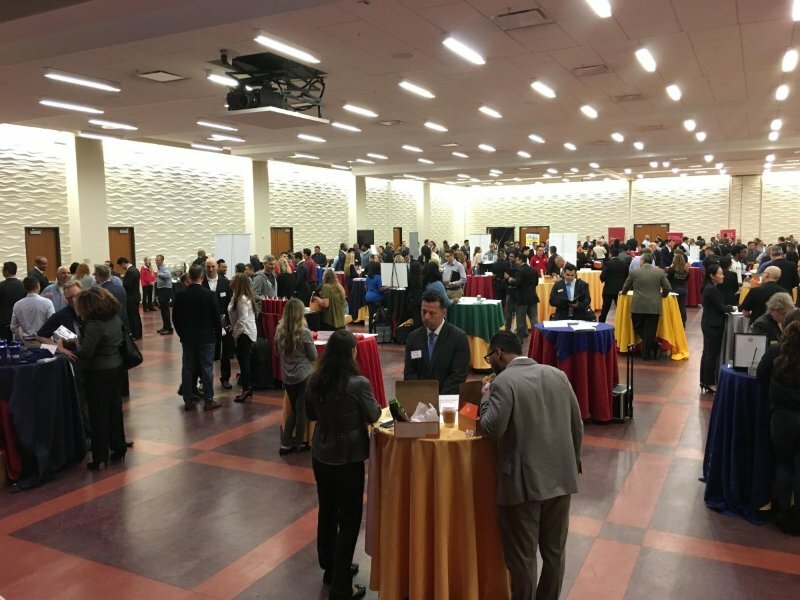 Employers mingled with students, recent grads, veterans and their families. We has over 200 participants and 45 employers come out and network. Special thank you to all of our employer partners who came out: Boeing Angela Infante Cedars-Sinai Stephen Bettini Amazon, Southern California Edison (SCE) Jawana McFadden BMW Group Bay Alarm Company Emily Pizinger Kaiser Permanente Raytheon Northrop Grumman Ron Brand PayPal St. Joseph Center Farmers Insurance Northwestern Mutual PRICEWATERHOUSE COOPERS, S.C. Teledyne Scientific & Imaging Young’s Market Company IBM Union Bank West Monroe Partners U.S. Secret Service Target Team Rubicon Synchrony Financial Pacific Park Management, Inc. JM Eagle Guitar Center Federal Bureau of Investigation (FBI) Farmer John – Clougherty Packing, LLC Enterprise Rent-A-Car Expediters International Coro Southern California and more. And a special thank you to the USC Career Center, USC Veterans Association and Veterans Alumni Association. We can’t wait until next year!